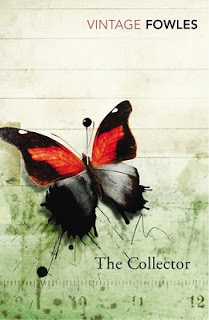 The Collector by John Fowles was featured last year on one of my favourite TV shows The First Tuesday Book Club on the ABC. Here is a link to the segment on the show, reviewing the novel. This inspired me to read the book, and almost 12 months later, I finally got around to it. This Vintage Classic is about Frederick Clegg, an uneducated clerk, who is socially awkward, a little mad and collects butterflies. He is obsessed with Miranda Grey, and stalks her as he would a butterfly, and after winning a significant sum in the lotto, he plots to kidnap her. Disturbingly Clegg decorates the cellar of a house in the country purchased specifically for the purpose, even going so far as buying clothes and underwear for Miranda to wear when she 'moves in'. Clegg successfully captures Miranda and keeps her prisoner in his cellar, hoping that she will fall in love with him. Obviously she despises him although she does develop some sympathy towards the end. Clegg tries to treat her as well as he can, buying her whatever she asks for and does not beat or abuse her, although it's later revealed he is sexually impotent. The book is divided by two narrators, Frederick and Miranda. While Frederick is narrating the book is creepy and disturbing, and I couldn't put it down. When we're introduced to the voice of Miranda however, it was quite a jolt and I was looking forward to reading about her experience and the terror of being prisoner in this cellar. Disappointingly, this isn't what unfolded. Miranda is a young art student and very self-obsessed which very quickly got on my nerves. I agreed with the guests on the The First Tuesday Book Club that she was shrill and annoying, and almost an unsympathetic character. I thought she was pretentious, but having said that, her attempts at escape were extremely exciting, and the ending was unexpected and far from cliche. Written in 1963, I didn't feel this book was terribly dated which was a pleasant surprise for me. It's interesting to note that The Silence of the Lambs was published a mere 25 years later, and also has a butterfly on the cover, but obviously for different reasons. It's interesting to wonder if Thomas Harris included this as a tribute to The Collector or if indeed he was influenced by this classic. I would definitely recommend this to anyone who enjoys suspense and a good thriller without the blood and guts of present day novels. wow I have never come across the book...but it was a movie which I remember seeing and yes it was set and made in the sixties. Terence Stamp was the 'collector' and the movie scared the you know what out of me because I was only young!A far cry from his character in Priscilla Queen of the Desert. Thanks so much for your comment, looks like I might have to check out the movie. There's a reason why Miranda is so shrill, self important and spends more time describing herself and her views more than her terror and experience of being kidnapped. Basically, Fowles has used the book as a metaphor, suggesting that the "many" in society (people like Clegg who are creatively stunted and without opinion- see when they discuss atomic bombs for example, and who use the worlds resources without trying to give back- his feelings about giving to charity for example) stifle the "few" people in life who are creative and caring and want to make a difference (see Mirandas work with trying to stop atomic bombs). Fowles suggests its better to care even a little regardless of your character (hence why we as the reader are swayed into sympathising with Clegg more than Miranda). The ending suggests that eventually the many of society will kill creativity and stifle the few trying to change the world. The book is basically an outlet for Fowles opinions about life, many of Miranda and G.P's opinions are in fact his own. See Fowles "The Aristos" to learn more of his views of life. Very interesting read. That's a really interesting observation, I certainly didn't pick up on this when I was reading the book. There are plenty of layers within this book.